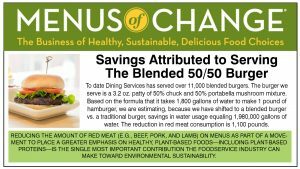 The Principles of Healthy, Sustainable Menus provide unique guidance for the foodservice industry and bring together findings from nutritional and environmental science perspectives on optimal food choices, trends in consumer preferences, and impacts of projected demographic shifts. To create a dynamic, invitational network of leading university-based scholars, foodservice business leaders, and executive chefs to collaborate on research and education in support of culinary-centric, evidence-based food systems innovation within and beyond universities. This initiative leverages the unique position of universities to advance healthier, more sustainable life-long food choices among students—who will soon be parents and adult decision-makers—by connecting a diversity of insights from academic programs, dining services, and athletics (performance dining). Menus of change download pdf. 1. Be transparent about sourcing and preparation. Providing customers with abundant information about food production methods, sourcing strategies, calorie and nutrient values, labor practices, animal welfare, and environmental impacts is a necessity in our technology-driven and networked era. Consumer engagement is driven by the rise in food safety and fraud alerts, a growing interest in sustainability and food ethics, and a hyper-connectivity that yields instant access to information such as impending crop failures or the latest farm-labor conditions across global supply chains. Consumers can learn about what they eat regardless of what chefs and businesses share. Given that, food operators can build trust by learning about environmental and social issues in the food system and sharing information about their own practices. Identifying the farms that grow key ingredients, for example, is a strategy that creates value and brand identity and one that is quickly becoming a standard practice. Going further and explaining how food is produced and the rationale for sourcing decisions are the next steps, while limiting or restricting information on hot-button consumer issues such as calories, trans fats, genetically modified ingredients, or processing methods are approaches not likely to survive over the long term. Operators who do not adjust business models and strategies to anticipate the impacts of this accelerating trend risk disappointing the dining public and having to play costly catch-up as such issues assume greater urgency with the public. 2. Buy fresh and seasonal, local and global. For chefs, peak-of-season fruits and vegetables can help create unbeatable flavors—and marketing opportunities. When designing menus, draw ideas and inspiration from local farmers and their crops during your growing season as well as the varieties and growing seasons of more distant regions. The advantages of local sourcing include working with smaller producers who may be more willing to experiment with varieties that bring interest and greater flavor to the table. A focus on local foods also can play an important role in building community by encouraging school children, retailers, media, and others to learn how to grow food, steward the land, and adopt healthier eating habits. But designing menus to draw on in-season fruits and vegetables from more distant farms also is a key strategy for bringing fresh flavors to menus throughout the year. 3. Reward better agricultural practices. Sourcing sustainably grown foods is complex, but there is one important rule of thumb: the environmental cost of food is largely determined by how it is produced. The best farms and ranches protect and restore natural systems through effective management practices, such as choosing crops well-suited for their local growing conditions, minimizing use of synthetic pesticides and fertilizers, and avoiding the use of groundwater for irrigation. Better- managed farms sometimes qualify for organic or other sustainable-farming certifications. But many—including smaller farms—simply adopt better practices. The most powerful strategies for supporting better farms include aligning menus to emphasize fresh foods during the peak of their local growing season and shifting purchases toward farms that have responsible management programs. 4. Leverage globally inspired, plant-based culinary strategies. Scientific research suggests that the most effective way to help diners make healthy, sustainable food choices is to shift our collective diets to mostly plant-based foods. Growing plants for food generally has less of a negative impact on the environment than raising livestock, as livestock have to eat lots of plants to produce a smaller amount of food. In fact, no other single decision in the professional kitchen—or in the boardrooms of foodservice companies—can compare in terms of the benefits of advancing global environmental sustainability. From the well- researched Mediterranean diet to the cuisines of Asia and Latin America, traditional food cultures offer a myriad of flavor strategies to support innovation around healthy, delicious, even crave-able cooking that rebalances ratios between foods from animal and plant sources. 5. Focus on whole, minimally processed foods. In general, consumers and chefs should first focus on whole, minimally processed foods. Such foods are typically higher in micronutrient value and less likely to contain high levels of added sugars, saturated or trans fats, and sodium. (Indeed, nearly three-quarters of the sodium in the U.S. food supply is estimated to come from processed foods.) Whole, minimally processed foods are also typically slowly metabolized, preventing sharp increases in blood sugar that over time may lead to insulin resistance. That said, some minimally processed foods—low- sodium tomato paste, wine, nut butters, frozen fruits and vegetables, mayonnaise, dark chocolate, canned low-sodium beans, 100 percent whole- grain crackers, fresh-cut vegetables, spice mixtures, yogurt, reduced sodium sauces, many kinds of canned fish and shellfish, among other things—can be incorporated into healthy meals. Processing can also be used to extend the season of local and sustainably grown produce and to make use of cosmetically imperfect foods, especially produce. 6. Grow everyday options, while honoring special occasion traditions. The foodservice industry historically developed around special occasion dining. Today’s industry, however, is increasingly responsible for providing everyday food choices to a substantial segment of the U.S. population. From a health and environmental perspective, there will always be room in the industry for indulgence and special occasion foods. However, the real opportunity in menu and concept development is the expansion of everyday food and menu choices that embrace current nutrition and environmental science, as well as emerging consumer values about how food is produced. 7. Lead with menu messaging around flavor. To sell healthy and sustainable food choices, lead with messages about flavor, rather than actively marketing health attributes. Research shows that taste trumps nearly all, even if customers want chefs, on some level, to help them avoid foods that increase their risk of chronic disease. Messages that chefs care and are paying attention to how and from whom they are sourcing their ingredients—such as by naming specific farms and growing practices (e.g., organic)—can enhance perceptions of healthier food choices (if, in fact, these choices are healthier— i.e., that they are also consistent with guidance for optimal nutrition). 8. Reduce portions, emphasizing calorie quality over quantity. Moderating portion size is one of the biggest steps foodservice operators can take towards reversing obesity trends and reducing food waste. This is different than offering multiple portion sizes, as many diners “trade up” to bigger portions, which they see as offering greater value. Consider menu concepts that change the value proposition for customers from an overemphasis on quantity to a focus on flavor, nutrient quality, culinary adventure, new menu formats, and the total culinary and dining experience (thereby mitigating potential downward pressure on check averages). Calorie quality is also important. Dishes should feature slowly metabolized whole grains, plant proteins including nuts and legumes, and healthy oils that promote lasting satiety and create great flavors. 9. Celebrate cultural diversity and discovery. Our respect for cultural diversity and the savoring and preservation of family traditions and centuries-old food cultures are as vital as our public health and environmental sustainability. 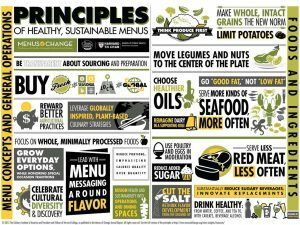 Fortunately, these imperatives are compatible with the Principles of Healthy, Sustainable Menus. Chefs collaborating with nutrition experts and public policy leaders need to reimagine the role of less healthy, culturally based food traditions by limiting portion size, rebalancing ingredient proportions, or offering them less often. At the same time, many chefs are reporting greater success from introducing new, healthier and more sustainable menu items instead of reconfiguring existing items. Emerging demographic changes and greater global connectivity are making the American palate more adventurous, giving foodservice leaders a long-term opportunity for creative menu R & D.
10. Design health and sustainability into operations and dining spaces. Food and menu design are not the only ways to advance sustainability in foodservice. Choices that affect the way restaurants and other foodservice operations are designed, built, and operated are also important. These include imagining kitchens that support the optimal preparation of fresh, healthy foods and selecting energy- and water-efficient equipment and environmentally friendly building materials. As behavioral economics studies have shown, dining-room operations and foodservice eating spaces also deserve more attention: design, set-up, service, and communication strategies can all lead consumers towards healthier, more sustainable choices. 1. Think produce first. Focus on fruits and vegetables first—with great diversity across all meals and snacks. Recognize that customers aren’t eating nearly enough—they should be filling half their plates with produce. Menus should feature green leafy vegetables and a mix of colorful fruits and vegetables daily. Fruit is best consumed whole or cut, fresh and in season, or frozen and preserved without added sugar or salt. Fruit juice often contains healthy micronutrients, but it also packs a large amount of fast-metabolizing sugar and should be limited to one small glass per day. Dried, unsweetened fruit is also a good choice; though it contains natural sugars, it also contains fiber, which can mitigate negative blood sugar response. 2. Make whole, intact grains the new norm. Menus should offer and highlight slow-metabolizing, whole and intact grains, such as 100 percent whole-grain bread, brown rice, and whole grain/higher protein pasta. Use white flour and other refined carbohydrates sparingly, as their impacts on health are similar to those of sugar and saturated fats. Ideally, new menu items should emphasize whole, intact, or cut—not milled—cooked grains, from wheat berries and oats to quinoa, which can be used creatively in salads, soups, side dishes, breakfast dishes, and more. In baking, blend milled whole grains with intact or cut whole grains to achieve good results. 3. Limit potatoes. Potatoes have rapid metabolizing impacts on blood sugar, which is of special concern as they are regularly used as a starch to fill plates. Chefs can limit their use of potatoes by combining small portions of them with other, non-starchy vegetables or featuring them as an occasional vegetable, as they do green beans, broccoli, carrots, and peppers. Chefs should also consider healthier alternatives including sweet potatoes, which are rich in beta-carotene and other vitamins, and healthier side dishes that highlight fruits, vegetables, whole grains, legumes, and nuts. 4. Move nuts and legumes to the center of the plate. Nuts and legumes are full of flavor, contain plant protein, and are associated with increased satiety. Nuts contain beneficial fats, while legume crops contain fiber and slowly metabolized carbohydrates. Legumes also are renowned for helping to replace nitrogen in the soil and produce impressive quantities of protein per acre. Nuts (including nut butters, flours, and milks) and legumes (including soy foods and legume flours) are an excellent replacement for animal protein. They also are a marketable way to serve and leverage smaller amounts of meat and animal proteins. 5. Choose healthier oils. Using plant oils and other ingredients that contain unsaturated fats, such as canola, soy, peanut, and olive oils, as well as featuring fish, nuts, seeds, avocados, and whole grains, are simple ways to create healthier menus. Research shows that reducing saturated fat is good for health if replaced with “good” fats, especially polyunsaturated fats, instead of refined carbohydrates such as white bread, white rice, mashed potatoes, and sugary drinks. High-flavor fats and oils that contain more saturated fat—including butter, cream, lard, and coconut oil— can have a place in healthy cooking if used only occasionally in limited, strategic applications. Trans fats from partially hydrogenated vegetable oils, now labeled a “metabolic poison” by leading medical scientists, have no place in foodservice kitchens. 6. Go “good fat,” not “low fat.” Current nutrition science reverses the mistaken belief that we need to limit all fat. Moderate and even high levels of beneficial fats in the diet—from (most) non-hydrogenated plant oils, nuts, nut butters, avocados, and fish—are associated with optimal nutrition and healthy weight. Beneficial fats paired with an abundance of vegetables, whole grains, legumes, and nuts can give our diets a baseline of slow-metabolizing, healthy foods, which are associated with increased satiety. A more liberal usage of healthy fats, offering the potential to deliver high-impact flavors, might represent the difference between consumers liking—or not liking—healthier and more environmentally friendly foods. Even small, occasional servings of deep-fried foods and condiments are appropriate offerings if operators use healthy, non- hydrogenated oils, and avoid potatoes, breading, and other refined carbohydrates in favor of fish, vegetables, legumes, and legume flour. Research confirms that the vast majority of people report better adherence to a moderate- or higher-fat, healthy diet. 7. Serve more kinds of seafood, more often. Seafood is an important part of a healthy diet, and most Americans don’t eat the recommended one to two servings per week of fatty fish, which contain higher levels of health-promoting omega- 3s. However, the focus on just a few species is emptying parts of the oceans of popular types of seafood such as cod and tuna and now also fish like menhaden that are a key ingredient in feed for some types of farm-raised fish. Scientific studies have found that the benefits of eating seafood greatly outweigh the risks and that removing or reducing seafood from the diet can have negative effects on health. Serving more seafood more often from responsibly managed sources is the priority. Chefs can have a positive impact on the environment and public health by expanding their understanding of how to source and use a greater variety of responsibly managed and underutilized wild-caught and farm-raised fish and shellfish. 8. Re-imagine dairy in a supporting role. While there is tremendous innovation underway to improve dairy production and its impact on the environment, the nutrition science on dairy is still unsettled and evolving. Current research suggests that it seems prudent for individuals to limit milk and dairy to one to two servings per day. Chefs should leverage the flavor of cheese (high in saturated fat and sodium) in smaller amounts and minimize the use of butter. Yogurt (without added sugar) is a good choice for professional kitchens, as its consumption is associated with healthy weight. 9. Use poultry and eggs in moderation. Chicken and other poultry in moderation is a good choice for healthier protein with a far lower environmental footprint than red meat. Chefs should avoid or minimize the use of processed poultry products, which are high in sodium, often as a result of sodium pumps and brining. Eggs in moderation—an average of one per day—can be part of a healthy diet for most people. Creative menu items that mix whole eggs and egg whites for omelets, and eggs with vegetables, are ideal. 10. Serve less red meat, less often. Red meat— beef, pork, and lamb—can be enjoyed occasionally and in small amounts. Current guidance from nutrition research recommends consuming a maximum of two 3-ounce servings per week. Chefs and menu developers can rethink how meat is used by featuring it in smaller, supporting roles to healthier plant-based choices, and experimenting with meat as a condiment. From at least some environmental perspectives (e.g., GHGE, feed efficiency ratio), pork is the better choice among red meats (though not distinguishable from a nutritional perspective). Saturated fat is one health concern associated with red-meat consumption, but it’s not the only issue. Chefs should strive to limit bacon and other processed and cured meats, which are associated with even higher incidence of chronic disease than unprocessed red meats. Many diners choose to splurge on red meat when they eat out, and there will always be an appropriate place for meat-centered dishes. But chefs can help to shift eating patterns by building a sense of theater and value in menu concepts that don’t rely so heavily on a starring role for animal protein. For example, they might offer delicious meat/vegetable and meat/legume blends, or smaller tasting portions of red meat as part of vegetable-rich, small-plate formats. 11. Reduce added sugar. Consumers crave sugar, and the foodservice industry responds by selling processed foods and sweets that are loaded with it. But sugar’s role in spiking blood-sugar levels and increasing rates of type 2 diabetes and other chronic diseases means that professional kitchens should substantially restrict its use. Various strategies include: choosing processed foods with little or no added sugar; favoring healthy oils over sugar in products such as salad dressings; featuring smaller portions of dessert augmented with fruit; and substituting whole, cut, and dried fruit for sugar in recipes. There is nothing wrong with an occasional dessert; but pastry chefs and dessert specialists need to take up the challenge to create sweets centered on whole grains, nuts, dark chocolate, coffee, fruit, healthy oils, yogurt, small amounts of other low-fat dairy and eggs, and, as appropriate, small amounts of beverage alcohol— with the addition of only small to minimal amounts of sugar and refined carbohydrates. 12. Cut the salt; rethink flavor development from the ground up. The foodservice and food-manufacturing sectors have long been too reliant on salt to do the heavy lifting to create high flavor impact and customer satisfaction. Single items, such as a sandwich or entrée, might contain more than 2,500 milligrams of sodium, well above the current maximum recommended intake of 1,500 milligrams to 2,300 milligrams for the entire day. Chefs should focus on a range of other strategies to deliver flavor including: sourcing the best-quality, high-flavor produce; working with spices, herbs, citrus, and other aromatics; and employing healthy sauces, seasonings, and other flavor-building techniques from around the world. Many chefs are finding success in focusing their innovation where they have the highest aggregation of sodium (e.g., processed meats, cheese, and bread) in a single menu item. Others are making progress in implementing an across-the-board incremental 10 to 20 percent sodium reduction in their preparations. Still others are focusing on collaborating with manufacturing partners to reduce sodium using alternative strategies to create desired flavors and textures. 13. Substantially reduce sugary beverages; innovate replacements. A drastic reduction in sugary beverages represents one of the biggest opportunities for foodservice operators to help reverse the national obesity and diabetes epidemics. Sugary beverages add no nutritional value and contribute negligible satiety. Yet they are a prime source of extra calories in the diet and a principal contributor to the development of type 2 diabetes, heart disease, and other chronic conditions. Smaller portion sizes and less frequent consumption are steps in the right direction, but nowhere in foodservice is there a greater need of creative, “disruptive” innovation than in the challenge to replace current soda and sugary beverage formulations with more healthful options. Operators should diligently research, support, and promote the products of entrepreneurs and emerging and established brands that are rapidly developing beverage solutions in this important area. Diet sodas and other diet beverages, though lower in calories, may reinforce an aggregate preference for sweet flavors, potentially driving down the appeal of vegetables and other healthy foods. As such, they should be consumed in smaller portions less frequently. 14. Drink healthy: from water, coffee, and tea to, with caveats, beverage alcohol. Water is the best choice to serve your customers, either plain or with the addition of cut-up fruit, herbs and aromatics, or other natural flavors—but no sugar. Served plain, coffee and tea are calorie-free beverages containing antioxidants, flavonoids, and other biologically active substances that may be good for health. Wine, beer, and other beverage alcohol present a more complicated story of benefits for many individuals, with some offsetting risks. Current nutrition guidance suggests a maximum of two drinks per day for men, and one drink per day for women.